Looking back on 40 years of the Balmain Market. Located in the grounds of St. Andrews Congregational Church on the corner of Darling Street and Curtis Road, Balmain, this 40-year-old local market is rich in history. 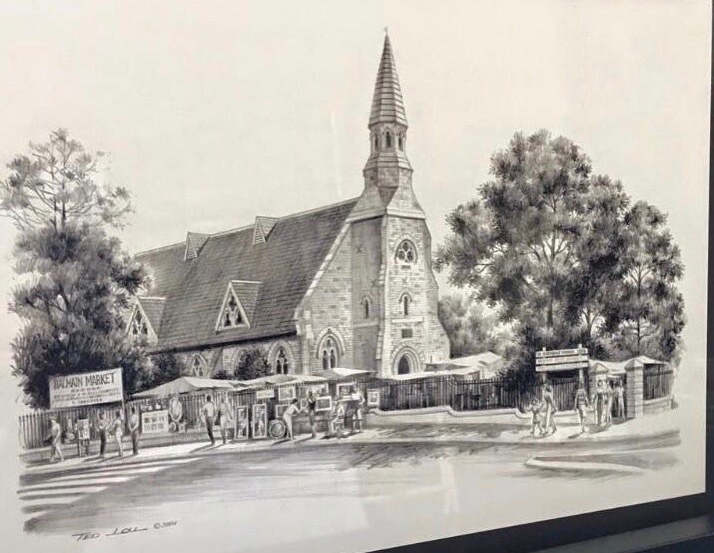 The original concept for what is now known as the Balmain Market dates back to 1971 when some local residents formed the Balmain Association, holding an annual Arts & Crafts sale just before Christmas at The Watch House. This then evolved into the Balmain Village Fair in 1974 and by 1976 it had grown in popularity and outgrown The Watch House. In 1977 locals Eve Chapman and Louis Butler approached the church with a proposal to launch a community market in the church grounds. An agreement was reached and the market commenced trading that year. The Reverend Peter Carter undertook management of the market until his retirement in 1996, during which time it grew to become one of Sydney’s most well-known and successful ventures of its type. Reverend Allan Filipaina took over in 1996, further expanding the market and introducing refuge to the homeless and victims of domestic violence, offering free meals. Balmain Market continues to provide financial support to the local community and other charitable organisations. In 2011 Reverend Allan was elected Moderator of the Congregational Federation of Australia and New Zealand, a post that required a lot of travel and made it impossible for him to continue management. Between 2011 and 2014 the market was managed by a caretaker who unfortunately didn’t share the same passion and drive as the past Reverends and many stall holders and customers drifted away. Reverend Allan returned in 2015 and took control of the market once again. With support from his family and some very loyal stall holders, he made it his mission to bring the market back to its former glory. In 2016 it was given a boost with the addition of new team members who embraced the Reverend’s mission to make this once-fabulous community market thrive again. Local resident and Cobden & Hayson agent Samantha Elvy is also a proud sponsor. This support, along with additional council funding, has seen a positive transformation with the market celebrating its 40 year anniversary in 2018.